This child development facility is designed as a series of “family houses” organized around two central courtyards. Each of these “family houses” operate as a distinct community, providing a smaller scaled “neighborhood” identity for each child. 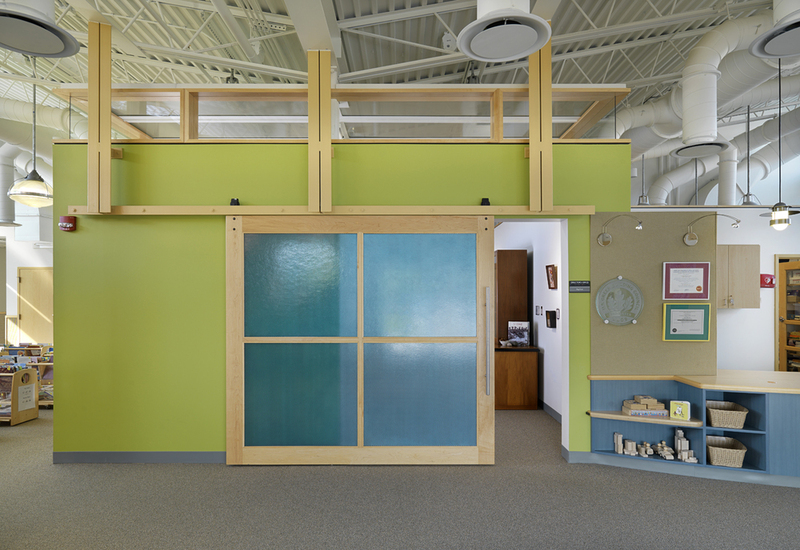 As each “house” contains one home-base classroom of each age group from infants through school-age, this design encourages a “continuity of care” program model, where children and caregivers can progress through adjacent homerooms from year to year. 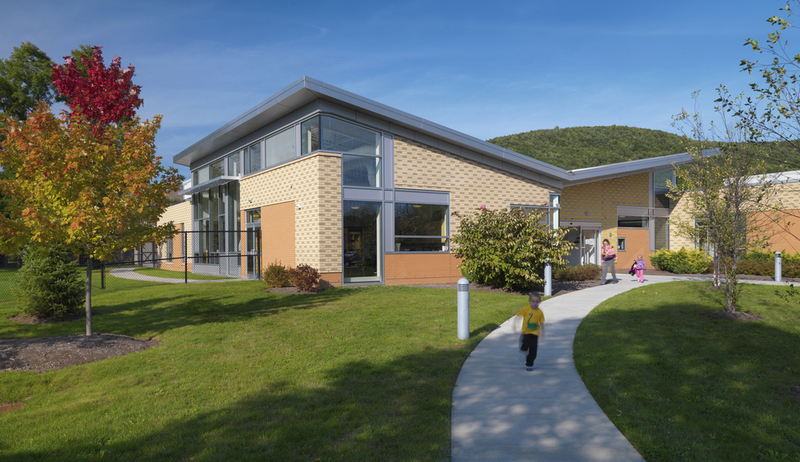 The family house design was particularly well suited for this center because it allows for incremental expansion based on child care demand in the Corning community. 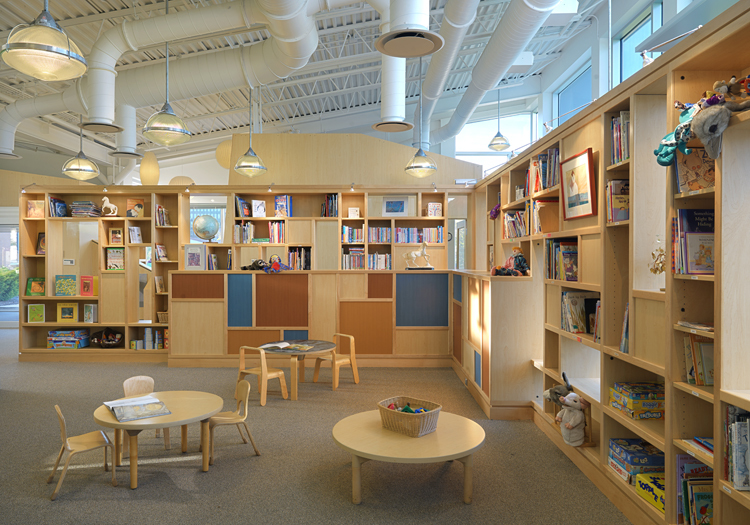 The center features destination places such as an art studio, library and specialized play-yards which provide opportunities for “field trips” without leaving the center. Natural outdoor play is an important curriculum component for this center. 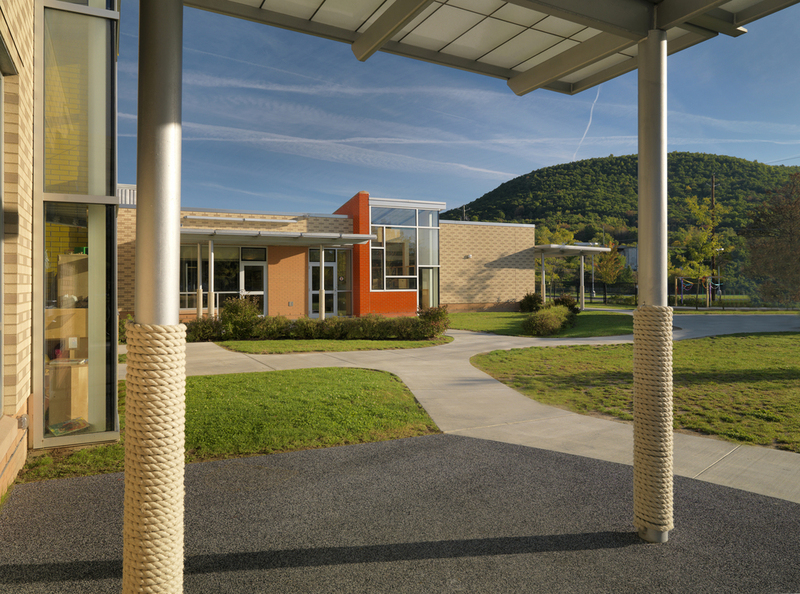 The building was therefore designed to maximize the connection between the classrooms and outdoor play areas. All of the classrooms have direct access to the playgrounds. There is a range of outdoor spaces with a variety of enclosures to ensure that the children can enjoy the natural world through all seasons and types of weather. In support of this concept, the building is organized around two landscaped courtyards with adjacent covered patios. The courtyards allow for play during windy winter days; the covered areas allow for outdoor play and art projects during rainy weather. The building incorporates numerous strategies to optimize daylighting of interior spaces as well as to integrate natural light as a primary aspect of the learning environment. 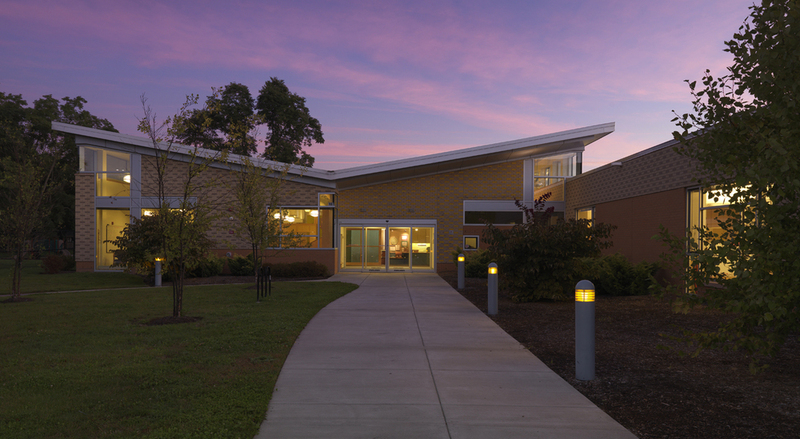 The central pavilion is configured with a butterfly roof; the higher side walls have clerestory glazing which admits daylight to the interior spaces (including the entrance, reception area, library, administrative offices, etc.) 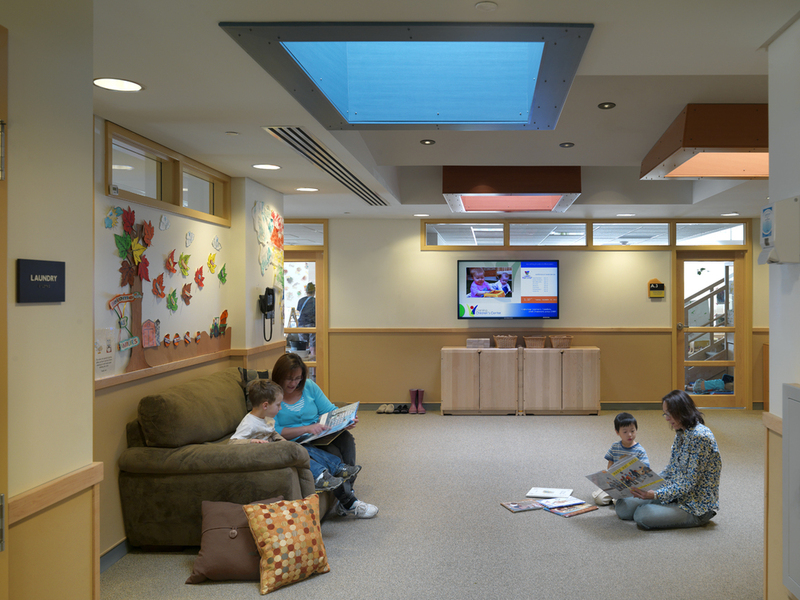 The home-base classrooms in each “family house” are organized around a central “family room” which is daylighted directly with skylights and with borrowed light from adjacent classrooms. 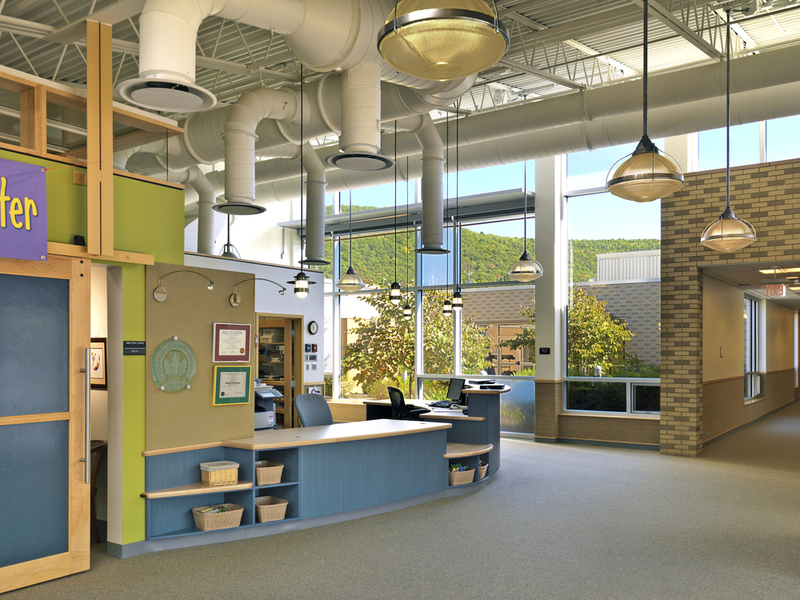 Responding to the unique aspirations which were set for this building, and inspired by Corning’s history as a preeminent glass manufacturing company, "light labs" were devised; their architecture conceived of as a backdrop to stimulate children's play and curriculum innovation on the part of the teachers. “Light labs” receive natural light through an array of operable and fixed transparent, translucent and screened glass panels. Their imprint on the exterior building form is expressed in their volumetric articulation as they pull forward and upward, and their uniqueness is underscored by the varied coloration of glazed brick. Within most classrooms, spatial zones were created to support unique activities (without limiting overall flexibility). These areas, which D. W. Arthur Associates termed “light labs,” are conceived as an open cubic volume that straddle the exterior building envelope. This space is articulated through a projecting bay window, a glazed brick side wall, and a high translucent roof. The interior planes that would complete this volume are suggested but left open so that the space is continuous with the rest of the classroom. In most cases, this zone is further defined with a raised loft (which incorporates valuable storage below.) The glazing at the exterior is configured in an abstract composition and includes translucent and other types of glass, which modulate, refract and otherwise modify the incoming daylight. A structural armature above the lofts is equipped with screens and specialized lighting to support light and shadow play, as well as to further model incoming daylight. These “light lab” zones are intended to support light and color play (along with many other purposes such as quiet story time, etc.) At the exterior of the building, the “light labs” are a strong presence, punctuating the otherwise continuous brick mass and providing differentiation and classroom identity through varied coloration of glazed bricks.